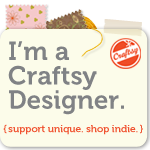 I’ve recently discovered a great online store that sells batik fabrics (known as Bali fabrics in some parts of the US) at REALLY good prices. 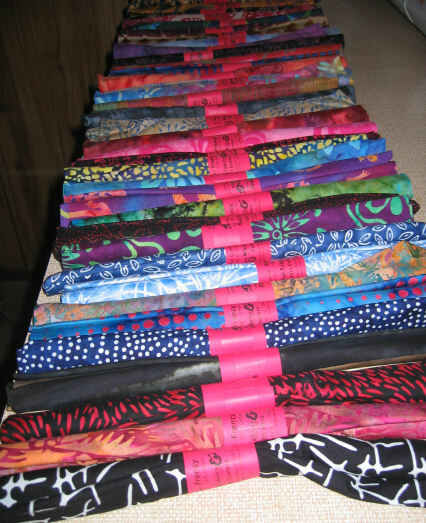 My first experience with them was to buy a yard each of six different fabrics that were on sale for less than US$10 a yard (that’s about $12 Australian, MUCH cheaper than the typical $25 per metre we pay here for batiks). Even their non-sale prices are much cheaper than here. But as with any online purchase, shipping can make or break the deal. The website — http://www.batiks.com — didn’t have any information on whether they shipped to Australia, nor what the shipping rates would be, so I emailed them. I got a reply within 24 hours, with enough detail to do my calculations and place an order. They notified me the day my parcel shipped, and I received it within two weeks. The fabrics were gorgeous! 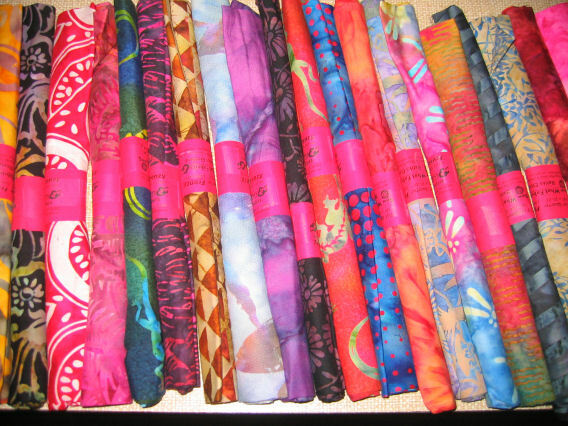 I’d also signed up to their newsletter and a few weeks later found out they were having a ‘fat quarter frenzy’ of their batiks — US$25 for 25 fat quarters! That’s US$1 each!! 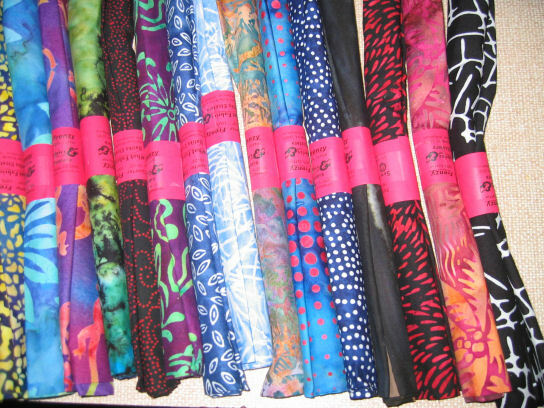 Even cheap non-batik fat quarters in Australia start at $3.50 each and can often be around $7 each. 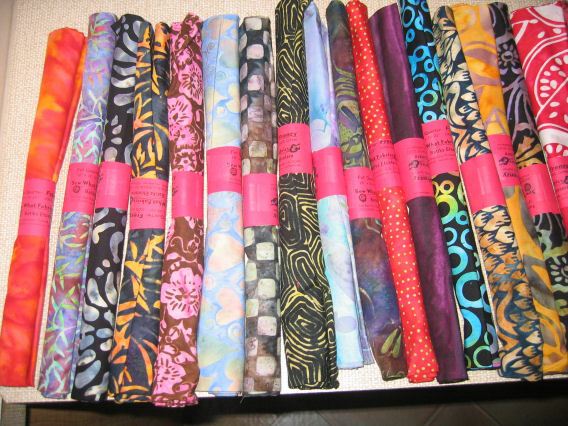 It was too good a deal to pass up, so I ordered two mixed sets of fat quarters — 50 fat quarters for US$50. 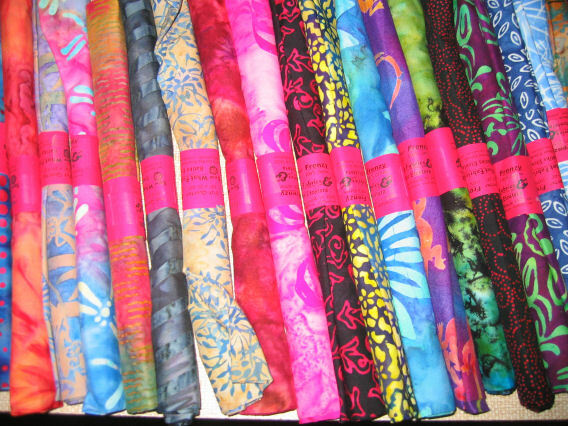 Even with shipping of US$26.90 (two parcels), the total of close to US$77 (AU$90), meant that each batik fat quarter cost me less than AU$2. As I said MUCH less than I’d pay here. Update 12 September 2009: I emailed batiks.com that I’d blogged about them. Within 12 hours I had a lovely reply from the owner of the store! Nice. There’s absolutely nothing wrong with good, old-fashioned personal service — it’ll get me coming back every time!